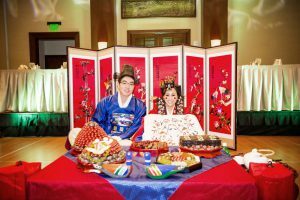 Traditional Korean wedding ceremony has a unique and special event called Pyebaek. Pyebaek is a well-known Korean wedding custom and it was one of must-do things in traditional Korean wedding culture. 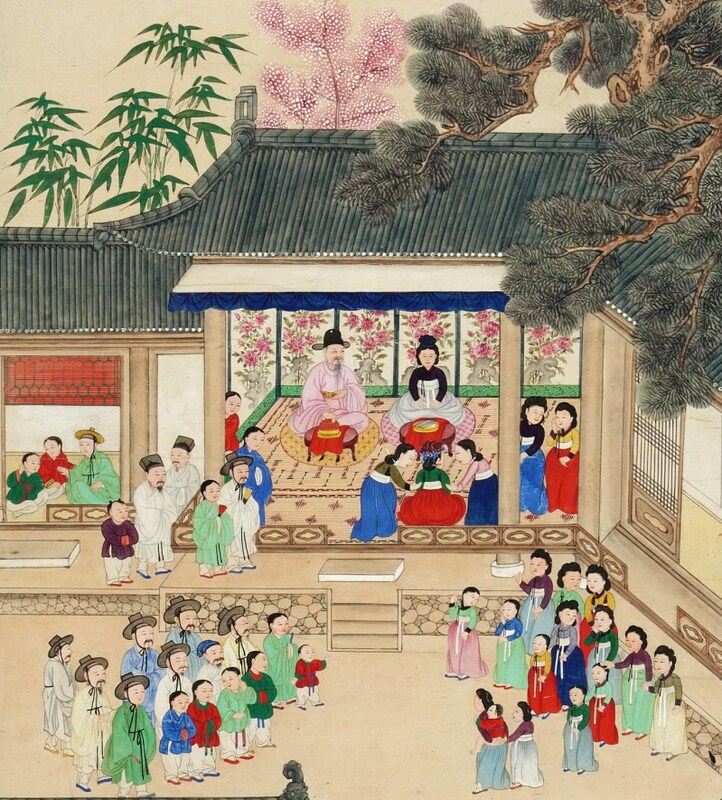 Pyebaek was one significant meaning of symbolizing the bride's transition from her own family and single life to the groom' family and marriage life. Originally the bride and groom perform the bow ceremony to only groom's parents and in-law families so traditional way of Pyebaek was only with family members and no guests' presence. It is unclear when this has entered and incorporated the modern and western style wedding process. Nowadays Pyabaek ceremony procedure and its meaning are changing to informal styles. It is now one of special event options, not mandatory procedure in modern Korean wedding culture. 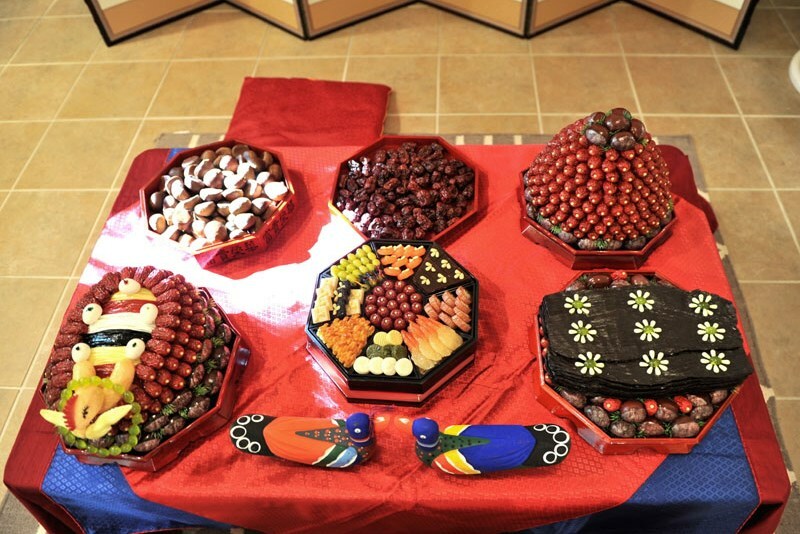 Even if there are still tradition and custom matters but in current days pyebaek ceremony is more for style, event, and fun party so both of families and guests are enjoying to see this unique Korean tradition. Now it was developed to many different styles and simple ways in preparation food, and procedure. Koreans tend to have small traditional ceremony right after the western style wedding ceremony. Bride's family and guests are participating as receiving bow or watching to enjoy the ceremony. It is like to be invited into Korean history and culture. 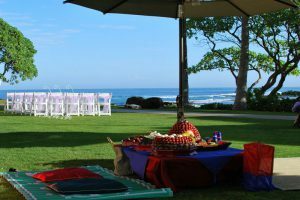 It can be a very exciting and fun ceremony for all wedding parties of bride and groom, bride's families, in-law families and guests, especially when the wedding parties are destination weddings, multi nationality couple and families. 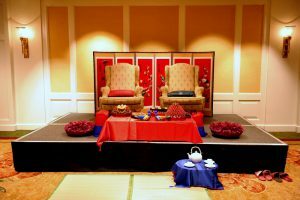 It is a respectable and meaningful way to incorporate Korean culture and it makes a fun event in American weddings. 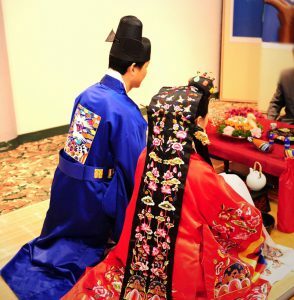 Because of so many special aspects of meaning, culture, dresses, and procedures, Pyebaek events make the wedding ceremonies meaningful, unique and interesting. Pyebaek held after wedding ceremony and it takes about 30 minutes. 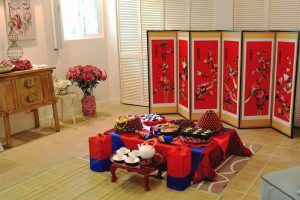 Bride and bride family prepare two pyebaek tables with jujubes, chestnuts, traditional snacks, beef jerky, and wedding cuck in a big table and Cheongju(known as refined rice wine)with tea kettle and cups on a small table. The wedding duck symbolize the sacred promise of a wedding ceremony for the 100th anniversary. This is a peculiar procedure. 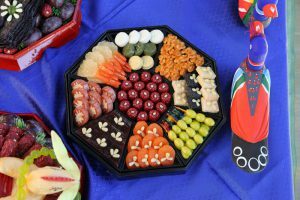 Originally stacked jujubes is for serving to the bride's father in law and chicken is for serving to the bride's mother in law, Gujeol-pan (nine-sectioned plate), wine. The main pyebaek table will be positioned between groom’s parents and newlyweds. After the parents seated, newlyweds make a deep bow to the parents and the parents throw some jujubes and chestnuts to bride's long embroidered apron. Bride catches them with her apron and that means a symbol of fertility into it. At the same time, the parents wish the couple's happiness and good luck for their new life start. Even if grandparents and grandmothers of a married couple are alive, the first bow should be given to the parents. Then, in order of age and generation and it continues to go on to family members. In order to celebrate the new person, the family members give gifts(usually money) or throw dates and chestnuts on bride skirts or apron. Originally, Basic Pyebaek foods are chestnuts, jujube, beef jerky, chicken, and Gujeol-pan(Platter of Nine Delicacies). The chestnuts and jujubes are for father-in-law and the pheasant and beef jerky are for mother-in-law. But beef jerky can be served itself instead of chicken. If one of the parents-in-law cannot participate in Pyebaek, the related foods should be excluded. 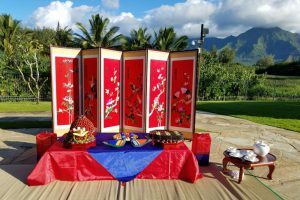 Each food item on the pyebaek table has a very special meaning and message to the bride and groom to wish being a perfect and happy family. All of these are from original and traditional procedures but in current days, pyebaek ceremony is being changed to modern ways in simple procedures, replacing replica food and celebrating with the brides side of the family and wedding guests. -Gujeol-pan(9 delicacies) is a meaning of fortune and good luck. Bride gives Pyebaek foods which include beef jerky to the mother-in-law and jujube(Korean dates) to the father-in-law before bow. The mother-in-law receives and touches the foods meaning of acceptance the daughter-in-law as a family member from now on. Bride's right hand should be cover left hand and groom's hand is opposite way from bride. Original way is that total bow should be 4 times to the parents(3 times full bow & 1 time half bow) and seat on the mat. The bride offers some snacks first and serves Cheongju(wine or tea) to the parents-in-laws. In return, the father-in-law wishes the words of wisdom. And the newlyweds catch them using bride’s apron. It goes on to family members by elders from groom's family first then bride's family. Originally tossing chestnuts and jujube is only from the groom parents but bride's parents and some elder do in current days. After each bowing, the couple serves wine or tea to the elders. Some offer an envelope with money hoping to spend while the couple's honeymoon. For siblings and cousins, the couple only do 1 full bow and not receiving money or words of wisdom. The siblings and cousins will do a light bow to the couple. The couple should not bow to any of unmarried brothers or sisters. After bowing the couple will share a drink. The bride will hold one jujube in her mouth and the broom will bring it with his lips. 한국의 웨딩문화 중에서 폐백은 신부가 친정에서 혼례를 마치고 시댁으로 들어와 시댁의 가족의 일원이 된다는 의미로 시부모님을 비롯한 어른들에게 처음으로 예를 갖추어 시댁에 드리는 신부의 예를 담은 행사입니다. 신부는 미리 친정에서 준비한 대추, 밤, 육포, 술 등을 포함한 폐백음식을 준비해 폐백상 위에 올려놓고 시댁 어른들께 큰 절을 올리게 됩니다. 즉 한국의 전통 혼례 속에서의 폐백은 시댁으로 입문하는 며느리와 시댁 가족들간의 행사였으며 신부의 처갓집이나 혼례에 초대되는 하객들과는 무관한 행사였습니다. 폐백음식의 구성은 밤 대추고임, 육포 혹은 폐백닭(꿩), 구절판이 기본 구성입니다. 대추와 밤은 시아버님께 드리고 닭(꿩)은 시어머니에게 드리는 음식입니다. 원래는 닭 대신 꿩으로 예를 갖추었으나 꿩을 구하기 어려워 폐백닭 또는 육포로 준비하기 시작하면서 폐백상 위에서 닭과 육포를 볼 수 있습니다. 여기서 중요한 점은 만약, 시부모님 중 한 분이 안 계실 경우 거기에 의미에 해당하는 음식이 제외되며, 두 분다 계시지 않을 경우, 상기 음식은 준비하지 않습니다. 폐백에서 밤과 대추를 신랑 신부에게 던지는데 이것은 자식을 많이 낳고 재산을 축적해서 행복하게 살라고 기원하는 뜻이 담겨 있어 밤 대추 고임은 부와 자식 번창을 의미합니다. 육포 또는 폐백닭(꿩)은 넓은 마음으로 며느리를 이쁘게 맞아 달라는 의미로 시부모님께 드립니다. 구절판은 완전함을 상징하는 숫자 9라는 의미로 은행, 곶감, 잣솔, 어포, 연근 정과 ,다식 등의 9가지 안주로 만들어진 음식을 담아내어 완전함과 충만함을 내포한 의미로 올려지는데 이는 부와 행운의 상징입니다. 이렇듯 폐백 상에 올려진 음식 하나하나에 깊은 뜻이 있으며 이는 신랑신부와 가족들이 결혼이라는 예를 통해서 새로 꾸며진 가정에 축복, 다산, 재물, 건강, 화목, 성공 등의 기원을 모두 담은 행복한 음식 상이라고 할 수 있습니다. 즉 폐백은, 정성 가득 담아 차려낸 폐백상과 이를 올리고 받는 신랑신부나 가족들 모두 새롭게 출발하는 한 가정이 완벽해기를 바라는 소망을 담은 아름다운 의식입니다. 그러나 결혼식이 서구화된 현대 시대의 폐백은 유서 깊은 전통의미를 그대로 가지면서도 실제로 의식과 절차는 많이 간소화되어 진행하는 것이 일반적입니다. 전통적인 혼례처럼 시댁에 들어가 치르는 폐백이 아닌 지금은 결혼식을 마치고 이어서 약 30분간 결혼식에 참석한 어른들께 예를 갖추는 것으로 간소화되었고 전통적인 방식대로 시댁 어른들께 인사를 드리지만 친정부모님들이나 경우에 따라서 결혼식에 참석한 친척 어른들께도 예를 갖추는 등 격식에 치우치지 않고 결혼식이 열리는 행사장의 장소에 맞추어 자유롭고 간소화되어 진행되는 경우가 많아졌습니다. 특히 결혼식 장소가 예식장으로 국한되던 때와 달리 교회나 채플, 가든이나, 별장, 야외 그리고 하우스 등에서 결혼식을 진행하는 커플들이 늘어나고 있는 최근에는 폐백 행사 스타일도 이에 따라서 준비하는 방식도 진행하는 방식도 다양화 되어 있습니다. 그리고 혼례에서 필수 행사였던 폐백이 최근에는 결혼식에서 생략하는 경우도 늘어나고 있습니다. 뿐만 아니라 폐백 음식 준비도 간소화되어 꼭 필요한 밤 대추와 육포 정도만 준비해서 폐백을 진행하는 경우도많습니다. 특히 어느 한쪽이 한국인이 아닌 국제결혼 커플들 사이에서는 오히려 이 전통적이고 한국적인 폐백 행사는 결혼식을 하는 당사자들이나 가족들 그리고 결혼식 하객들에게도 흥미로운 행사로 어필되어 인기를 더해가서 오히려 이벤트의 일환으로 이 폐백 행사를 하는 이들이 늘어나고 있습니다. 하와이에서 결혼식을 진행할 때 데스티네이션 웨딩커플들 중 신랑신부 양쪽 다 한국인 커플들도 많지만 국제커플들도 아주 많습니다. 하와이의 결혼식장은 호텔 연회실, 호텔 야외가든, 비치나 해변, 교회, 채플, 렌치, 프라이빗 하우스 등 다양하지만 꼭 필요한 필수품들만으로 구성된 간소화된 폐백 행사는 어느 장소에서도 진행이 가능합니다. 아름다운 한국의 전통의식 폐백. 결혼식에 참석한 하객들에게도 즐거운 시간을 제공해줄 폐백은 점점 접근하기 어렵고 딱딱한 행사라기보다는 보는 이들이 새롭게 탄생되는 가정에 드리는 아름다운 소망과 기원이 담긴 행복한 행사라는 의미로 꼭 해 볼만한 이벤트라고 추천드리고 싶습니다. 특히 이 색다른 행사를 체험해 보지 못한 외국인들의 경우 한국의 역사와 문화 속에서 전통적으로 내려온 폐백의 의미와 아름다운 의식을 보면 색다른 체험으로 즐거울 것이고 가족과 하객 모두가 즐기는 하나의 결혼식 테마가 될 것입니다. •	시어머님은 육포를 손으로 어루만지는데 이것은 앞으로 며느리의 허물을 덮어 준고 가족의 일원으로 받아들인다는 뜻입니다. •	신랑 신부는 같이 시부모님께 절을 올립니다. 시아버님께 먼저 올리고 시어머님께 올리는 순서지만 최근에는 한꺼번에 앉아계실때 같이 절을 올립니다. •	절을 올릴때 신부는 오른손이 왼손위에 올라가게 손을 잡고 신랑은 반대로 왼손이 올라가게 잡습니다. 신부는 손위에 긴 절수건을 덮고 절을 합니다. •	전통적인 폐백의 예로 시부모님께 4번의 절을 올려야 하나 최근에는 친정부모님께도 절을 올리므로 간소화 되어 2번의 절만 올리기도 합니다. •	한번은 손과 눈높이를 맞추고 양 발을 서로 맞대어 완전히 납작 앉아 드리는 깊은 절을 올리고 한번은 허리를 반 숙이는 반 절을 하고 돗자리 위에 앉습니다. •	신랑 신부는 절수건의 끝을 각각 잡고 밤과 대추를 받을 준비를 합니다. •	시아버지가 덕담을 해 주면서 부모님은 아들을 낳아 가정을 잘 계승하라는 의미로 며느리의 치마폭에 대추를 던져줍니다. •	시어머님이 자손이 번성하라는 뜻으로 밤을 절수건 위로 던집니다. •	신랑 신부는 밤과 대추를 치마폭이나 절수건 위로 잘 받습니다. •	시부모님께 드리는 예를 갖춘 후에 시댁 식구들의 연장자 순서대로 절을 합니다. •	원래는 시부모님들만 밤과 대추를 던졌으나 근래에는 관습에 얽매이지 않고 시할머니 또는 숙모님들 시댁 어르신들이 밤과 대추를 던지기도 합니다. •	어르신들은 절값으로 돈봉투를 준비해서 허니문 여행에 보탬이 되도록 신랑 신부에게 선물합니다. •	형제, 자매 혹은 사촌들은 한꺼번에 여러명씩 같이 앉아서 절을 나눕니다. •	이때 신랑 신부는 깊은 절을 한 번만 올리고, 절을 받는 형제자매 혹은 사촌들은 가볍게 머리를 내려서 맞절을 합니다. •	형제자매 혹은 사촌은 덕담을 하거나 돈을 주거나 밤대추를 던지지 않습니다. •	결혼을 하지 않은 형님이나 동생에게는 절을 올리지 않습니다. •	절을 모두 마친 후에 신랑 신부는 술잔을 나누어 마십니다. •	신랑이 신부를 업고 방을 크게 한바퀴 돌게됩니다. 그래야 큰집을 얻을 수있다는 뜻이 담겨 있습니다. •	폐백 생사를 모두 마치고 신랑 신부는 폐백상 앞에 앉아서 기념 사진을 찍습니다. •	결혼식 마치고 사진 촬영을 하듯이 부모님들과 함께 폐백상 앞에서 기념사진을 찍습니다. 폐백은 신랑측 혼주가 먼저 받게 되며, 그 뒤 순서는 항렬이 가장 높으신 분들로 차례대로 받게 됩니다. 모든 순서마다 신부의 모든 것을 수모가 대신 진행하는 것이 폐백의 원칙이라서 반드시 수모가 함께 행사를 진행해야합니다.